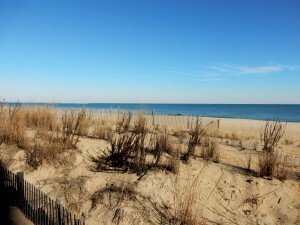 Beautiful weather in Rehoboth Beach, Delaware. 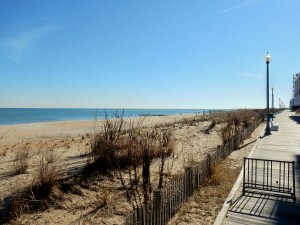 Walking the award winning, one mile Boardwalk is a past time for visitors and residents. At this time of the year is the perfect time to take a stroll with a friend or try to work out some of the food that has been enjoyed in our award winning restaurants. 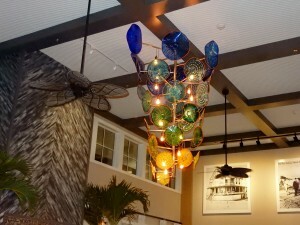 Rehoboth Beach is a dining destination and only a few hours from Washington, Baltimore, and Philadelphia. There you see Jody and I walking off scrapple on Sunday morning!! 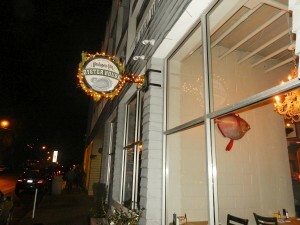 It has been quite some time since I last visited Henlopen City Oyster House located at 50 Wilmington Avenue in Downtown Rehoboth Beach. Tel. 302-260-9193 Website? 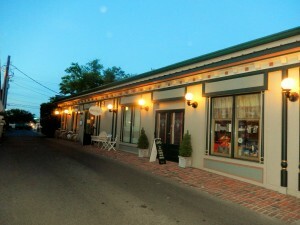 http://www.hcoysterhouse.com. 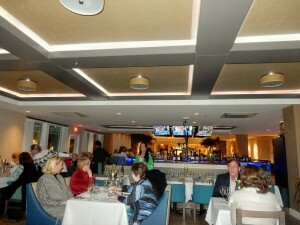 Henlopen City Oyster House is open daily. Lunch begins at Noon, Happy Hour at the Bar begins at 3 p.m. until 5 p.m. and Dinner begins at 5 p.m. Please note that they will be closing on Thursday, December 24th and Friday, December 25th. This restaurant is serious about oysters, so if you like them please make sure that while visiting Rehoboth Beach you make a point to stop. 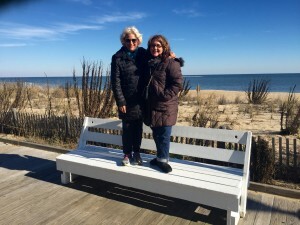 One of my other friends came from Bethany Beach to have a bite to eat before Christmas. 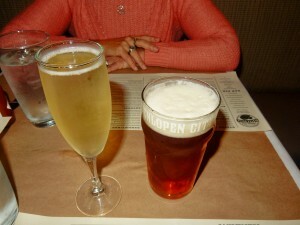 Cathy had one the beers on tap and I proceeded to have a glass of champagne. After discussing the menu with our server, which by the way was excellent, we decided to start with some salads. 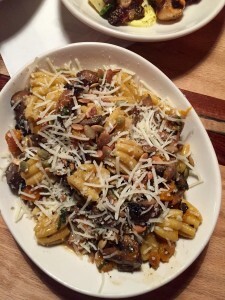 The menu changes daily but there are some dishes that are always on the menu. 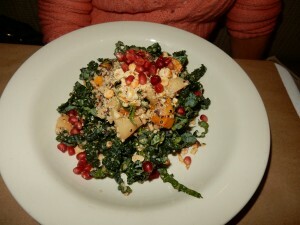 The Butternut Squash Salad had tuscano kale, quinoa, hazelnuts, pears, and pomegranate. I love beets so I will always order them if found on the menu. 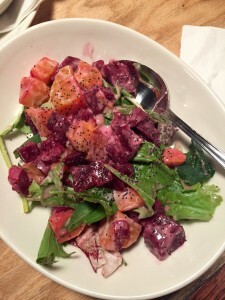 Their Roasted Beet Salad is always on the menu. Sunflower seeds, sliced pickled radish, feta cheese, and a balsamic reduction. Loved the 2 color beets!! 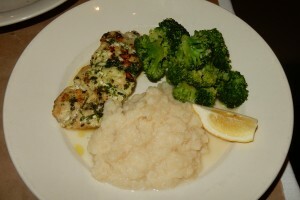 Cathy decided on the Herb Grilled Carolina Wreckfish brushed with fresh herbs, and served with her choice of Mascarpone Mashed Turnips and Broccoli. Wreckfish are from the bass family. They have a big head with a big mouth. They are found in waters ranging from 140 feet up to 3,000 feet deep. Although they are found all along the East Coast, most of the commercial fishery operates over the Charleston Bump, located 80 to 100 miles southeast of Charleston, SC. It was mild and perfectly seasoned. 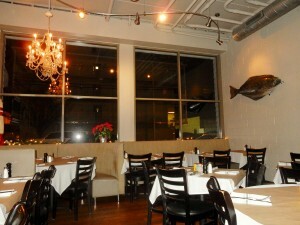 Even though Henlopen City Oyster House is known for oysters and seafood, they also have elk, wild boar and ribeye steak. 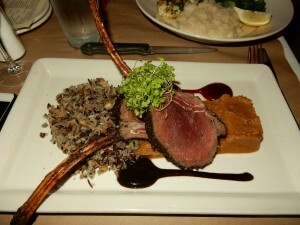 In speaking to our server he said the Shiitake Encrusted Elk Rack was amazing. So no brainer…that’s what I had and it did not disappoint. Cooked just like it should be eaten it had an amazing taste. It was oven roasted, with miso acorn squash, chestnut wild rice, black garlic, and lemongrass cranberry. Not to be missed. 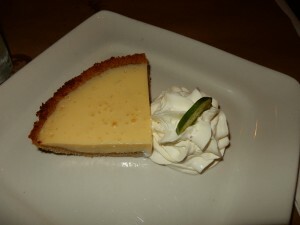 A sweet ending of Key Lime Pie for Cathy and I. It was good too. Just enough tartness and not overly sweet. Have a good one….kick back and relax!! 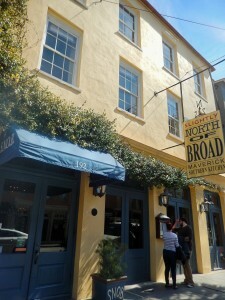 If you are in Charleston at this precise moment, SNOB is open for lunch. 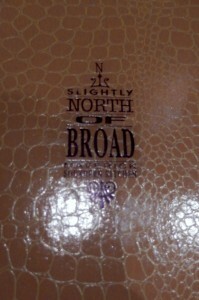 I went back to this popular restaurant having visited last February. I was intrigued by the fact that there is a new ownership since I last visited. Apparently everything is going well. Nevertheless, I wanted to try it for myself. 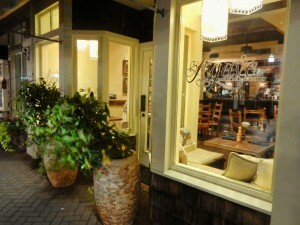 So off I went to 192 E Bay St. Tel. 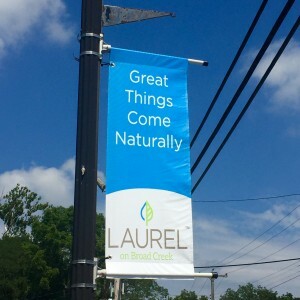 843-723-3424 They are open 7 days a week. Lunch from 11:30 a.m. to 2:30 p.m. and Dinner from 5:00 p.m. Reservations are accepted but for the Chef’s Table is first come first serve. 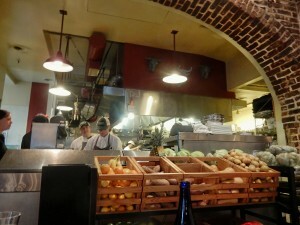 I sat once again at the Chef’s Table. This table, I believe has 6 seats. Usually, diners sit here because they are foodies and also get the opportunity to chat with others, more so if you are by yourself. You get a good view towards the kitchen. 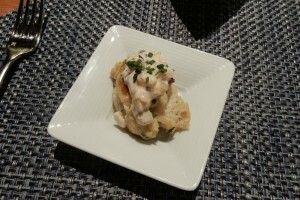 Plus you get a little starter from your server….a small crab cake tasting. 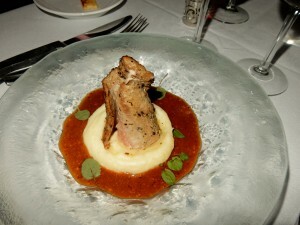 Last February I had their signature dish. That is worth a try. 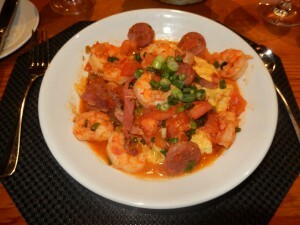 Shrimp & Grits no less, with house sausage, country ham, tomatoes, green onions, on top of delicious Geechie Boy grits. 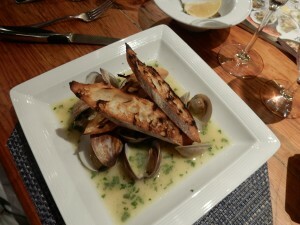 At the Chef’s Table this year: Steamed Local Clams with parsley, roasted garlic cream and grilled baguettes which were perfect for dipping into the broth. 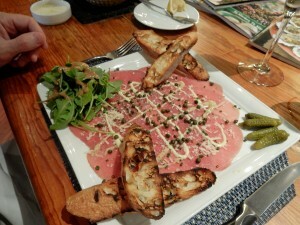 The Beef Carpaccio looked beautiful, perfect for a light lunch…thinly sliced raw beef, capers, pecorino Romano, and grilled baguette. 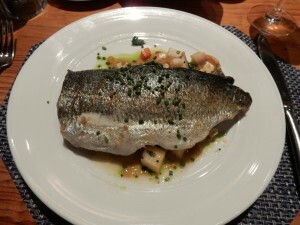 And, the Grilled Carolina Trout did not disappoint….So moist and perfectly seasoned. 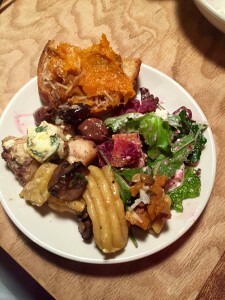 It was served over roasted root veggies, wilted greens and drizzled with a golden raisin vinaigrette. If you like fish, this is a good one to try. Please note that SNOB offers a Gluten Free Menu, so you will be able to have a nice lunch or dinner without any problems. No dessert this time, I was perfectly satisfied. 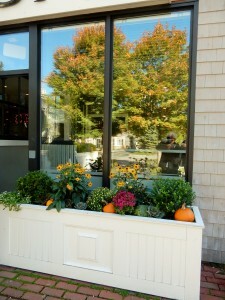 Lewes Eats! 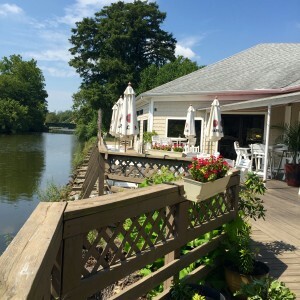 Agave, Mexican Cuisine, Restaurant, Bar, Lewes, Delaware, Southern Delaware, Delaware Beaches…Buen Provecho! One of my pet peeves is that I hate to wait. More so, at restaurants. 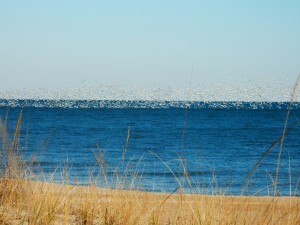 With so many popular restaurants not taking reservations at the Delaware Beaches, well, let’s say that at times it is a bit annoying. Not such a great way to start a post. 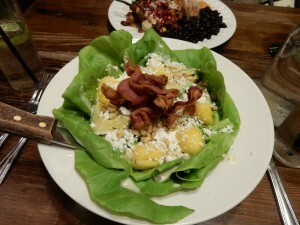 But, keep reading because I am posting about one of my favorite restaurants in Lewes…Agave. 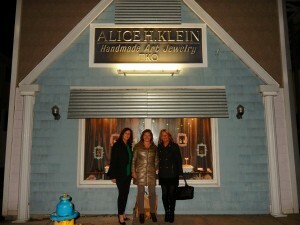 It is located at 137 2nd St. Tel. 302-645-1232. You can find it on Facebook. There are times that the wait at Agave is a couple of hours in the evening. 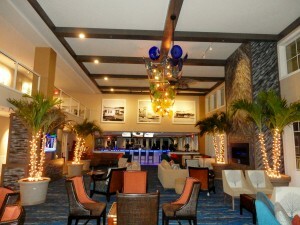 If you do not mind, please then head to the bar and start having some of the delicious Margaritas and Martinis that they do offer. Otherwise, you can put your name down and come back later. Or, if you do not want to wait, then you know what else you can do. 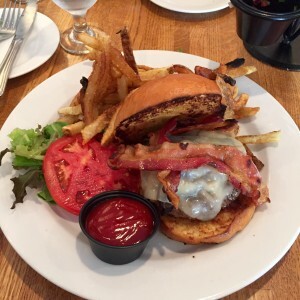 Maybe lunch might be a better idea for you. 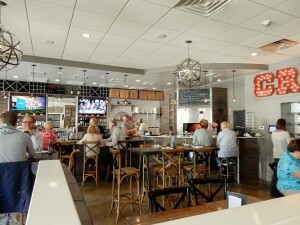 If you arrive right at Noon you might find the restaurant looking like some of these photos. But soon enough it will be crowded. 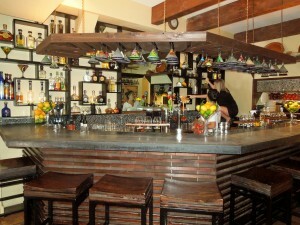 Originally, Agave was pretty small then an addition has given them more seating which is great. So the other night when Sharon and I arrived for a little Mexican fare, we were surprised that our wait was only like 20 minutes. 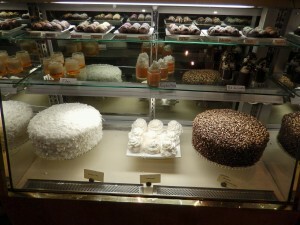 We sat looking at the gorgeous desserts…wondering if their famous Coconut Cake would be our choice for dessert. Or, Pot de Creme or Flan. I do have my favorites. 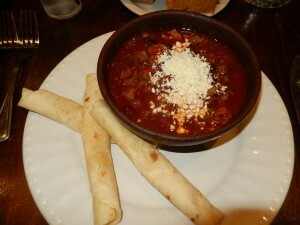 I started with their Mexican Chili. I truly love it. I don’t know if it is because it is made with beef tenderloin or not, but the flavor is so good. A rich broth, topped with queso fresco and a side of warm tortillas. On chilly night, it is perfect and pretty filling, as well. Their Mango and Avocado Salad is also a must have if you like something a littler lighter. The mango and avocado is in a bed of bib lettuce, topped with bacon, queso fresco, pine nuts and a creamy pine nut lime dressing. Queso Fresco is a crumbled goat cheese. 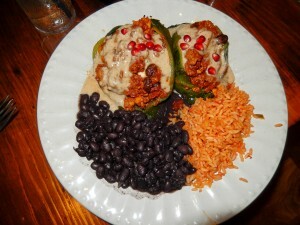 Agave has a signature dish called Chiles en Nogada. It is always on their menu. I told my friend, Sharon, that she should have it. This is meat stuffed poblano chiles with cumin, cinnamon and azafran. A drizzle of a nut sauce with an addition of rice and beans. These Chiles en Nogada is a sophisticaded dish most popular during Mexican Independence festivities. It incorporates the green, white, and red ingredients just like the colors of the Mexican flag. A poblano pepper is a mild chile pepper from the State of Puebla in Mexico. When it is dried out is is called Ancho Chile. It is a most popular pepper grown in Mexico. 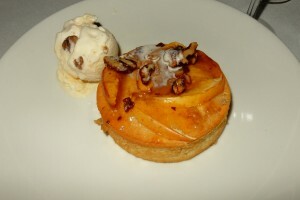 The dish above has a light sweetness to it, perhaps the outcome of the combination of ingredients. Very good indeed. We decided on the Coconut Cake for dessert but I had a reason for ordering it. First of all I have always heard that it is so good. 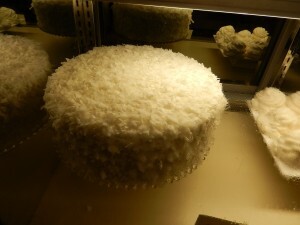 I am not too much of a coconut cake fan but I wanted to compare it to another coconut cake that people raved about served at the Peninsula Grill in Charleston, South Carolina. 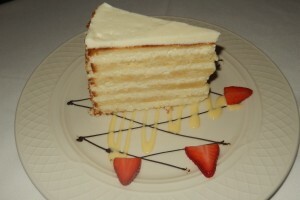 Last February while in Charleston everyone said we needed to try the cake at the Peninsula Grill. They said it so much that we made reservations. 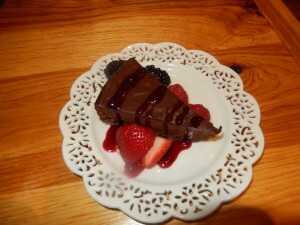 Great entrees, I posted on this website, and then came dessert time. This cake has 12 layers and they have been making it since 1997. There is even a trademark as Peninsula Grill Ultimate Coconut Cake. It weighs 12 lbs., and you can order it and be sent to you FedEx. 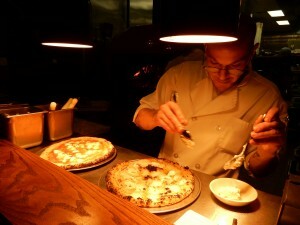 Every night you take a glimpse at tables and for dessert you will find the customers do order it a lot. 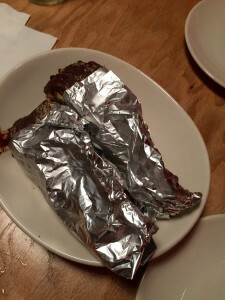 Here is a photo of my piece of cake. It reminded me of a Smith Island Cake. 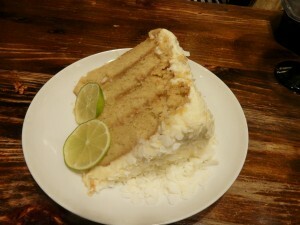 Agave’s Coconut Cake came to the table and it was huge. And we, actually, ate it all. Having had those two magnificent cakes I can tell you that I do prefer to have the individual layers on a cake, but the Agave’s version was definitely, more moist. I am probably not the best person to review a Coconut Cake, since I do like more tarts than cakes, but all I can tell you is that they were dense and full of flavor. 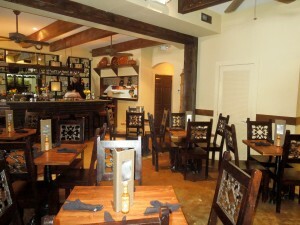 Next time at Agave’s try it and if by chance you are visiting Historic Charleston, check it out there, as well. You decide. Now, a lemon tart….love it!! 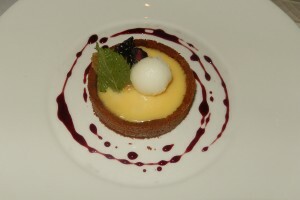 The photo of the lemon tart is from the second dessert we had at the Peninsula Grill in Charleston. 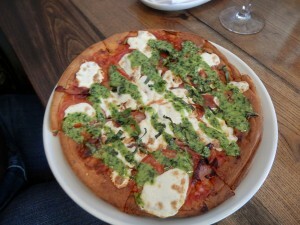 Comments Off on Lewes Eats! 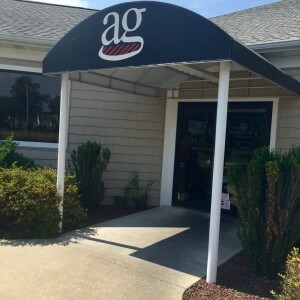 Agave, Mexican Cuisine, Restaurant, Bar, Lewes, Delaware, Southern Delaware, Delaware Beaches…Buen Provecho! 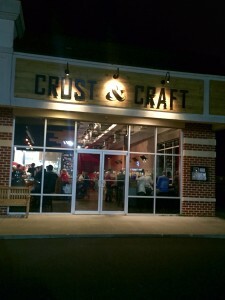 Crust & Craft opened in Rehoboth Beach, Delaware, about 4 weeks ago. 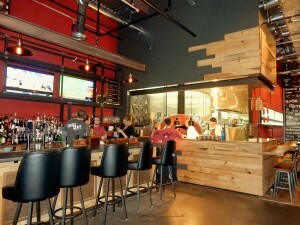 Pretty impressive to see this locale transform itself into a really nice looking place. And, the food, pretty awesome, as well. The address is 18701 Coastal Highway. Tel. 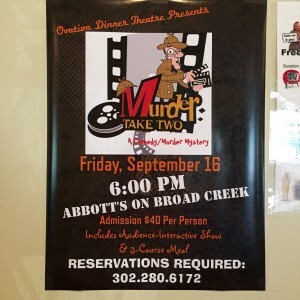 302-313-5029 Website? 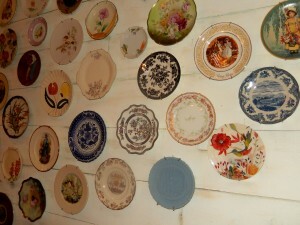 http://www.crustandcraftde.com. You can find Crust & Craft on Facebook! Please note that it will be opening this week-end for lunch on Friday, Saturday and Sunday at 11 a.m.
My friend, Cathy and I arrived very early. By the time we left every seat on the house was taken with the exception of one table. 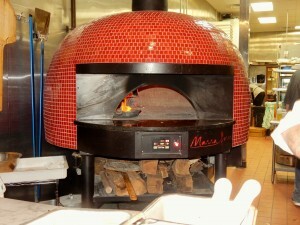 Some pizzas were coming out of their oven….you can customize your pizzas!! 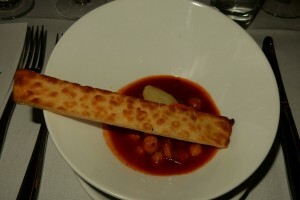 The menu is divided into Hearth…Bruschetta. Then, Ocean which are starters from the sea. Continuing with Earth which are seasonable veggies. 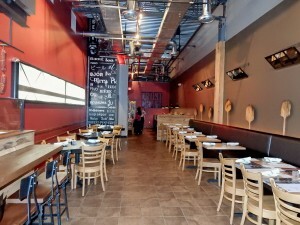 Fire means 12″ wood-fire pizza and finally Stone which is their housemade pasta. Our strategy was to order more than a few dishes tapas style. 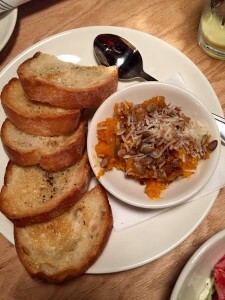 From the Hearth we ordered the Roasted Squash, Pumpkin Seeds, Pecorino, and Balsamic. I don’t know what it was but the combination of the roasted squash and the rest of the ingredients on that toasted bread was perfect. 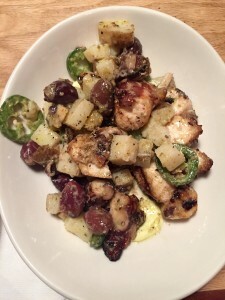 The Ocean brought us Wood Roasted Octopus, Olives, Potato, Oregano, Jalapeno, Lemon Maionese. 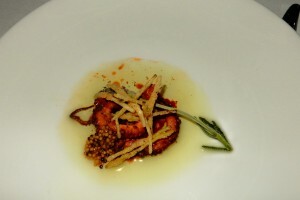 The octopus was tender and had a definite wood roasted flavor. 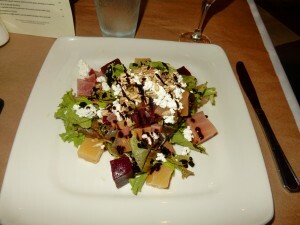 Earth…the Beets, Ricotta, Greens, Poppy Seeds, and a Lemon Vinaigrette. Loved it! The Lemon Vinaigrette gave it a bit of a tangy taste. Stone…The Pumpkin Zucca, Mushroom, Squash, Sage, Brown Butter, Peccorino, Pumpkin Seed….This dish was excellent. The pasta absorbed the pumpkin flavor. It was one of my favorites of the evening. 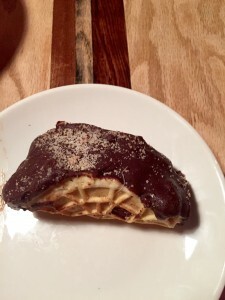 Of course we did not need any dessert but we did have it….Choco Tacos made out of Pizzelle, Mascarpone Semifredo, and Nutella…..Decadent, so much so that Cathy and I took off for the Rehoboth Boardwalk to walk off this one. I would like to thank our server, Brittany, for taking care of us in such a speedy way. Her recommendations were on target. 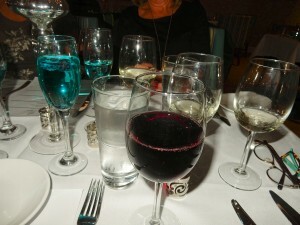 Loved everything we ordered. 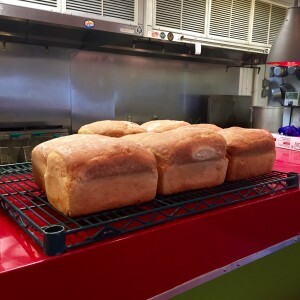 I almost forgot to tell you that Crust & Craft partners with local farmers and craft beer artisans….Congratulations and wish you much success. We will be back!! Have to try the pizza. 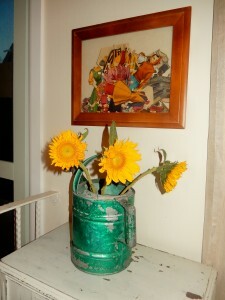 I remember in 2008 when my late husband was diagnosed with Celiac Disease. Immediately I jumped into the whole idea that I needed to know everything possible about this new way of eating for my family. People with Celiac Disease, which is an allergy to wheat, only can get better by following a gluten free diet. People would tell me then how lucky I was because a lot of them that had been diagnosed years before really had trouble finding good quality food and had more trouble having dinner at restaurants who really did not know what this “gluten free” way of eating was all about. Now I tell the newly diagnosed Celiacs that they are lucky because it is a business. 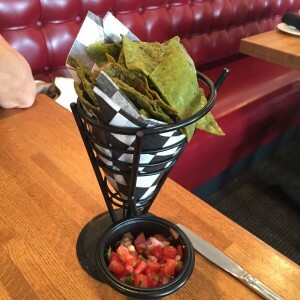 Restaurants that thought this was a fad diet and who said “we are not a gluten free restaurant” have had to rethink and join the many other restaurants that are preparing delicious gluten free entrees for those that need this diet for their health. If you have a gluten allergy, any of their pizzas can be made gluten free. 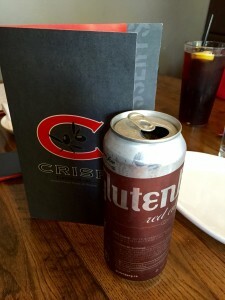 They also have gluten free beer. My choice on that day was Glutenberg Red. Refreshing and very good. 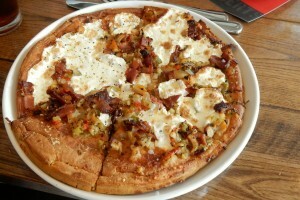 The regular dough uses organic flour, filtered water and Cape Cod Sea Salt for Crisp crust. 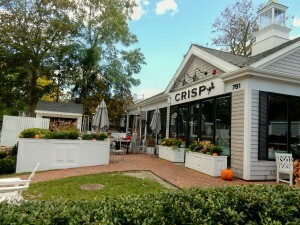 Crisp opens every day…Monday to Saturday from 11:30 on and Sunday Brunch begins at 10:30 a.m. 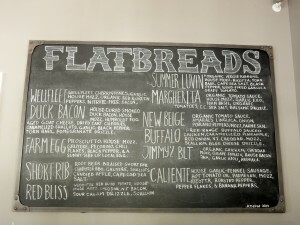 Supporting local farmers and using nitrate free meats and organic veggies is something this restaurant does whenever possible. 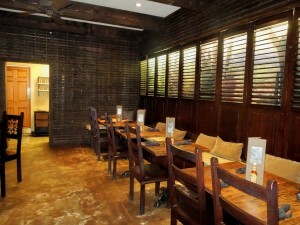 Their pastas and sauces, along with the flatbreads are all made in-house. We chose a Margherita Pizza which had organic tomato sauce, house mozzarella, garlic, EVO, torn basil, organic tomatoes, Cape Cod Sea Salt, and a balsamic drizzle. I had not had a pizza with clams, but I did on that day. Mine was called the Wellfleet, which had cherrystones, garlic, house mozzarella, organic red and green peppers, and nitrate free bacon. Loved it. It hit the spot. 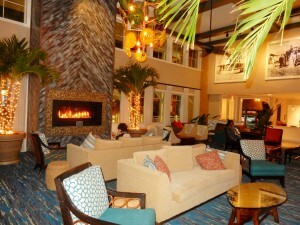 The fall season brings cooler temperatures to the Cape, but at Crisp you can still sit outdoors next to the fire pit. Or, you can also play some table tennis. I am looking outside my windows and all I see are gray skies and a light drizzle….I hear your pain if you are visiting us this week-end at the Delaware Beaches. But look at the brighter side. Change of scenery. You left the city. You can still walk, shop tax free and of course, there is always plenty to eat. Weather like this brought back to my attention the most delicious baked chicken, so far, around here. Let me tell you a bit about where you can go and try it. I am not kidding you; it is the best. 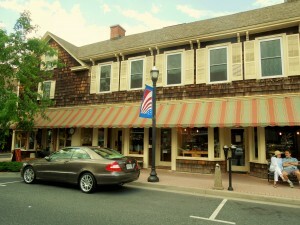 Nectar Cafe & Juice Bar is located at 111 Neils Alley, Lewes, DE 19958. Tel. 302-645-5842. Website? http://www.cafenectar.com You can also find it on Facebook. 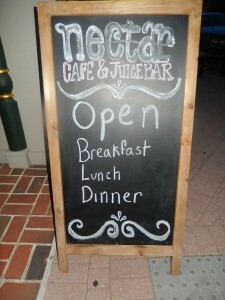 Nectar is open every day for breakfast, lunch and dinner. 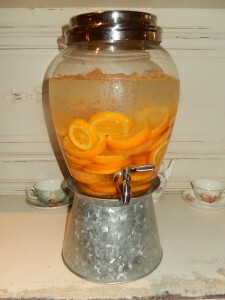 They also have an amazing juice bar, where you can even customize your juices. This is the second year for Nectar and a few months ago, they started serving dinner. Everything is made in-house. The restaurant is comfortable. 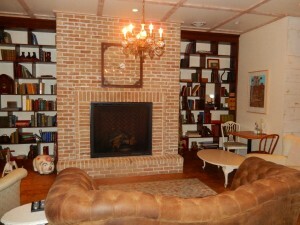 You may take a seat on the sofa and have a drink . It is the cutest place. You will get half a chicken, which has been marinated and baked in iconic Dogfish 60min IPA and served with beer honey-mustard glaze. 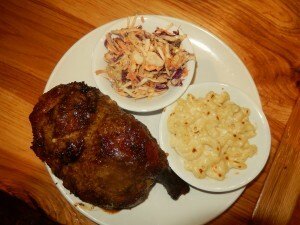 Comes with mac and cheese and coleslaw. It is best eaten, of course, with a cold bottle of 60 Minute IPA…just add $3 extra. It is so good and a very generous portion. Just try it for yourself and let me know. 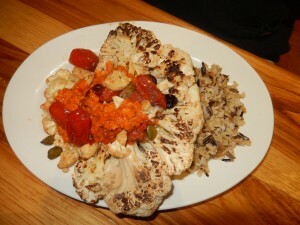 Another dish that I am also very hooked on is their Cauliflower Steak, served over rice pilaf with Romesco sauce and topped with olives, capers and roasted tomato. This is a vegan dish. The cauliflower steak is first roasted and then finished in the frying pan. Romesco Sauce is a nut and red pepper base sauce that originated in the area of Terragona in Northern Spain. It is so good and a very generous portion, as well. You might think that the Chocolate Avocado Torte sounds different. Hey, that’s why I ordered it. If you love chocolate, you will love it too. The avocado is a healthy fat so don’t be afraid to try it, because it is delish. There is a cheese that is one of my favorites. 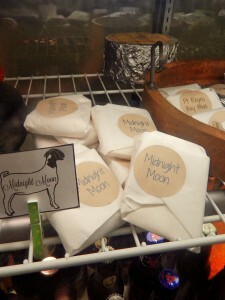 It is called Midnight Moon. Nectar carries it. I always think that it would be perfect to have it with a nice glass of wine, enjoying one of our full moons at the beach. Nectar is very aware of food allergies. Please ask if you have any questions because they have gluten free, vegan and they are happy to accommodate their customers. They want you back! !